With all the talk of building a “big, beautiful wall”, it can be easy to lose track of the issues that matter to the people of Mexico in the here and now. A presidential election will take place in July, and the current president, Enrique Peña Nieto, cannot stand for re-election because he is constitutionally limited to a single six-year term. In addition, last year saw a number of elections for state governors, who also have single six-year terms. “We’re just starting to work with many of the new governors in the states as they plan their investments,” says Mike deVente, Motorola Solutions’ vice-president and general manager, Latin America and Caribbean Region. He notes the country’s very serious security issues that need to be resolved and adds that “they [the governors] are working towards [addressing them]”. He explains that Motorola Solutions has been in the country for almost 60 years, and that some of its manufacturing and global resources (customer services for the US and technical support) are present in Mexico, in addition to the sales and support staff who handle its work in the region. DeVente highlights the extensive role that Latin America’s militaries play in terms of public safety, given the “sheer number of natural disasters” that take place in the region and the humanitarian support they provide while using mission-critical public safety solutions. Speaking of these, Mexico has recently suffered from a series of earthquakes – including, according to The Daily Telegraph, “two in September that together killed hundreds of people and brought buildings crashing down”. DeVente adds that Motorola Solutions worked closely with emergencies and public safety agencies in Mexico to support their rescue and relief efforts around the time of the September earthquakes. “There is a mix of different mission-critical technologies in the Mexican market. A lot of the time it is due to customers’ preferences,” says deVente. “[With a lot of the smaller municipalities, airports and metros, if they are looking to use [narrowband data] and don’t have [large coverage requirements], they typically opt for TETRA. We have [TETRA] deployments in Hidalgo, Chihuahua and Baja California municipalities, and they work just fine. The Morelos state has also opted for our TETRA system for public safety. When you’re talking about the state-wide systems or frontier coverage: state customers like Nuevo León, Yucatán, Guanajuato, Jalisco; and federal government agencies such as the Ministry of Defence (SEDENA), Ministry of the Navy (SEMAR) and the Attorney General of Mexico (PGR) – they selected P25 because they need the coverage that it provides and they don’t [currently] need as many of the features that TETRA has and they’ve adopted [P25] as a standard. 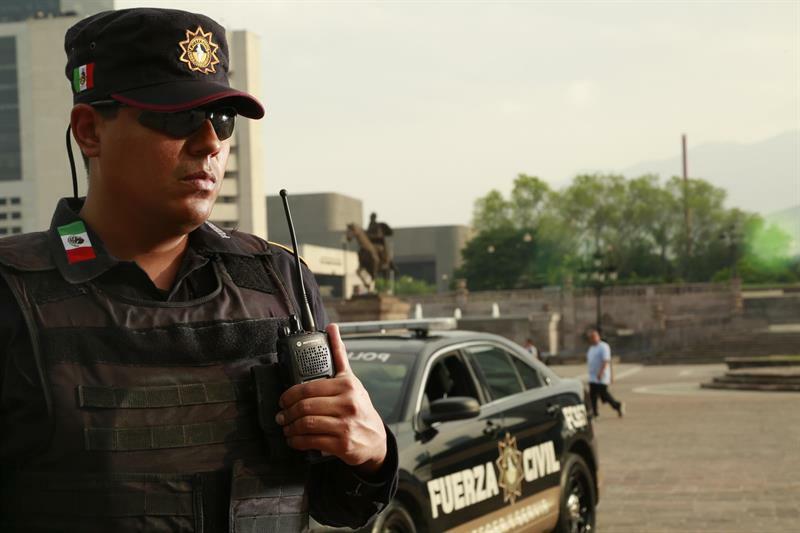 [Meanwhile], the Federal Police use Tetrapol, but the government is drafting a plan to use open-standard technologies such as P25 or TETRA.” He adds that a lot of municipalities in Mexico use DMR. Gallart says the biggest factor in Mexico’s LTE landscape is the roll-out of the Red Compartida LTE network. “This is a very ambitious public-private partnership (PPP)-type project by the Mexican government and Altan Redes (a Spanish consortium) to bring broadband connectivity to 92 per cent of the Mexican population. The Peña Nieto administration set aside 90MHz of 700MHz spectrum in band 28, and together with Altan Redes it will spend more than US$7bn to implement this network over a five-year period – by the end of March 2018, 30 per cent of the population will have access. “The idea is that Altan Redes will sell capacity to multiple MVNOs, and each MVNO will market its specialist solutions. This 5G-ready network will be able to guarantee QoS to a secure MVNO, and in this way first-responders will have the reliability they need to implement MCPTT, MCVideo, MCData and the many [public safety] applications they need. Gallart adds that until there is a full nationwide LTE network, it will be impossible for Mexico’s public safety agencies to transition to mission-critical LTE, since it will be difficult to have QoS in the areas where Altan does not have infrastructure. In addition, “the government is not looking to replace IRIS but to complement it”. Motorola Solutions’ deVente says satellite connectivity might have a role to play in some remote areas of the southern border with Guatemala, “although they’re making some very large investments [in that area at the moment] for terrestrial coverage”. He adds that Mexsat has been “slow going” and highlights both the loss of the project’s initial satellite in a launch explosion and the challenging economics involved. DeVente also highlights the way in which crime on the US-Mexico border, such as the smuggling of firearms and drugs, leads to urban crime. Given this, I ask if Mexico and its neighbours are considering an approach similar to the Inter System Interoperability projects being pursued in Finland, Norway and Sweden [see Richard Martin’s piece on this topic]. The nearest equivalent he is aware of is in the Caribbean. He adds that in Mexico, many P25 and Tetrapol customers are becoming increasingly interested in TETRA and that some have already purchased TETRA products. Teltronic’s NEBULA TETRA infrastructure covers the entire Mexican states of Guanajuato and Mexico, and is also being used by the Municipality of Puebla. Sepura also delivered a three-site TETRA solution to the Public Security Directorate of the Mexican municipality of Atizapán de Zaragoza in 2015, and further TETRA projects in 2017 for the Public Security Directorate of the municipalities of Tlalnepantla (four sites) and Huixquilucan (three sites). Vargas says since he began his involvement with TETRA back in 2009 when he started working for a Sepura distributor, the number of TETRA networks in Mexico has grown from two to more than 15, and Sepura now controls around 90 per cent of the Mexican TETRA market. He adds that his company has an advantage over its competitors in that the main reference projects in the country for TETRA use its products. One sector in Mexico where TETRA struggles is oil and gas – Vargas says Pemex, Mexico’s state-owned petroleum company, has opted for P25. However, because of this, the parts of the Odebrecht Lava Jato investigation that have involved Mexico’s oil industry have not impacted Sepura’s business in the country, nor its work with mining and oil and gas projects in other countries in the region, such as Argentina, Chile and Peru. One obstacle, albeit one that appears to be fading away, is that of spectrum management. “Frequency assignment in previous years has been very difficult, it’s quite a process to go through,” Vargas says, adding that staff turnover at IFT, the Mexican Federal Institute of Telecommunications, is high and that this has translated into drawn-out negotiations when it comes to getting frequencies. He adds that some users are occasionally using spectrum without permission while they continue to apply in order to get around the issue. However, currently IFT is in the process of putting Mexico’s frequency assignments in order and has launched tenders that will give the winners the right to manage the use of parts of the spectrum including 440-450MHz, which is a band suitable for TETRA. Vargas expects the situation to continue to improve. He notes that two years ago, a show-business company used unassigned frequencies for a major sporting event in Mexico City and was fined around US$5m, showing the authority’s increased awareness of the issue. “The challenge is that several decades have gone by where many of these frequencies are being used by other people right now inappropriately or even unknowingly to the customer,” says deVente. “So there’s probably quite a lot of work to do to clean those frequencies [up] before any systems using them can be installed.” He adds that the “winners of the lots have six months to present on how they plan to go about commercialising the spectrum”. In addition, spectrum is less of an issue for some projects than others. Vargas says Sepura (now part of the Hytera Group) last year won a tender to provide a mission-critical communications TETRA system to Mexico City International Airport and it already had the licences for the necessary spectrum. This project is currently in the process of being deployed. Moving away from Mexico towards the other major markets in the region, Airbus’s Gallart notes that “although Brazil is in dire need of some of the solutions we plan to implement in Mexico”, the country’s uncertain economic outlook, which has been caused by the Odebrecht Lava Jato corruption investigation, “makes it very difficult to determine when [investments] in some of these technologies will take place”. He adds that the scandal has involved many other countries in Latin America and that “until all of the issues get ironed out, many infrastructure investments are on hold”. Similarly, while “there are many projects in Venezuela, there is significant uncertainty due to its current political and economic conditions”. Over in Chile, Gallart says “we’re working with [the] Gendarmeria, but it is too early to tell as they have pushed out the decision-making process three times in the past three years”. The above doesn’t mean that the Mexican critical communications market lives a charmed existence, untouched by international affairs. Sepura’s Vargas says the Volkswagen diesel emissions scandal of 2015 delayed a large project to provide a system for the group’s car manufacturing plant in the state of Puebla. With the prospect of a nationwide LTE network capable of supporting MCPTT still many years away, the increasing ease at which narrowband technologies can be integrated with each other and with broadband, and the high stakes that Mexican first-responders face when battling the drug cartels, the Mexican market is definitely one to watch – especially in the years to come when the next wave of public safety applications have time to prove their worth in such a demanding market.